REMEMBER that time everyone got a bee in their bonnet about how the media focuses too much on government leadership speculation and not enough on policy? I do, because it was about a week ago. Since then we saw Julia Gillard dominate political discourse by inventing a whole new subtext to the wearing of blue ties and by becoming the national poster girl for retro crafts, thanks to a knitting-themed photo shoot for the Australian Women’s Weekly manufactured by her own press team that managed to put ‘‘gender’’ firmly back on the non-ironic menu. I’m not sure either of those things did much for policy discussion, unless there was some sort of funding announcement for the wool industry buried in the knitting story that I missed. And then there was the big one last night – the Labor leadership spill, part two. Worst. Sequel. Ever. Funnily enough, though, it bore some resemblance to the generally accepted best sequel ever, Terminator 2: Judgment Day, in that Kevin Rudd somehow managed to scrape himself off the ground and reform into K2, the Ruddinator, and now we’re all stuck with him again. Anyone ready to talk about policy yet? Didn’t think so. The newly-minted Rudd Government is barely intact itself, let alone devising election-winning policies. 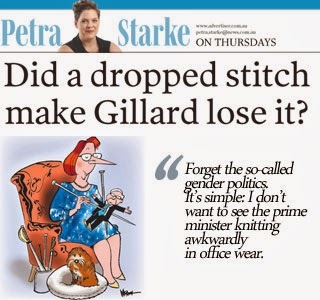 Maybe Ms Gillard can knit them back together, she’s got spare time now and she’s almost finished that kangaroo. It doesn’t need explaining that a photo of the prime minister knitting next to her cute, fluffy dog isn’t just a nice photo opp, it’s a calculated strategy to say ‘‘I’m human, I’m approachable, I like things you like, vote for me’’. This isn’t unusual, of course. Pollies have been photographed kissing babies and engaging in their favourite hobbies to win votes since day dot. Tony Abbott himself posed for the same magazine three years ago gripping every female relative he could find to show how in tune he is with modern women – before saying a girl’s virginity is ‘‘a gift’’ and that women shouldn’t ‘‘give themselves away lightly’’ to men. Way to give mixed messages there, Tone. But none of that generated anywhere near as much flak as ‘‘knitting-gate’’ did. gender card’’, whatever that means anymore. Others said Ms Gillard’s critics would have found a way to denigrate her no matter how she was pictured. I say forget the so-called gender politics. It’s simple: I don’t want to see the prime minister knitting awkwardly in office wear. (And that goes for you, too, Mr Rudd). overwhelmingly negative reaction to ‘‘gender politics’’ being played by all sides, the last thing I wanted to see was a staged shot of our first female PM extreme knitting in front of a wind machine gabbing about patterns. – strong, forthright, intelligent. I didn’t want to see her ‘‘soft’’ side. After last night’s shenanigans, perhaps we can assume her colleagues didn’t either. Only one thing’s for sure right now: Grab a copy of the Women’s Weekly, it’ll be a collector’s edition one day. First published in The Advertiser, June 27, 2013.